Do you suffer from chronic pain from arthritis? Headaches?Menstrual cramps? Toothache? Back pain? Foot pain? Let me tell you about a long lasting over the counter pain reliever. 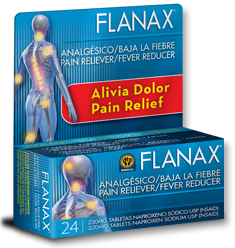 Flanax relieves inflammation and pain and lasts longer than acetaminophen or ibuprofen. Flanax contains naproxen which has a much longer half life than Tylenol or Motrin. Half life is the period of time required for the concentration or amount of drug in the body to be reduced by one-half. In general a drug is no longer considered pharmacologically active after one half life. This means that a drug looses much of it's effectiveness after one half life. Basically then Flanax's effectiveness to relieve pain lasts longer which means you take less pills and feel longer relief. * For adults and children over 12, take 1 tablet every 8-12 hours while symptoms last. For the first dose you may take 2 tablets within the first hour. 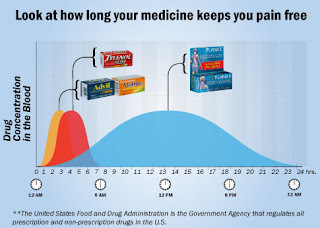 * Adults over 65 cannot take more than 1 tablet every 12 hours unless directed by a doctor. * For using Flanax Pain Reliever in children under 12 years old, always consult a doctor first. Until trying Flanax I had used ibuprofen for pain and worried about my stomach and the damage it could do to it. It did relieve my pain but had to take more every 6-8 hours. I would much rather take Flanax and have my pain gone longer and take less tablets. I received this product for free and will be compensated for my honest unbiased review.